After sharing with you the rough cut of our first national television ad, we've received an incredible amount of support and suggestions from our membership. This is an historic ad campaign, and we're working hard to get it right! All of your suggestions are giving us the tools we need to develop the perfect ad to highlight the face of the Tea Party! Thank you to everyone has viewed the ad and given us your suggestions! As we fine-tune the production of the television ad, it's important to keep in mind what our goals are. 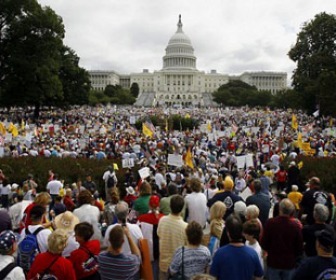 We've seen an increase in the frequency and intensity of the attacks against the Tea Party from the left. There is a segment of the American public that gets its impression of the Tea Party solely from the mainstream media, and it's become increasingly important for us to provide a strong counter-voice to the incessant lies being spread by big-government politicians and their allies in the media! Whether it's Joe Biden calling us "terrorists," Maxine Waters telling us we can go "straight to hell," or Jimmy Hoffa, Jr. calling us SOBs, it's obvious that no one in the mainstream media is going to stand up to defend us. This is why we're launching an aggressive media campaign across television, radio, and the internet. We will introduce America to the real face of the Tea Party: the single mothers, military veterans, blue-collar workers, and everyday patriots! Since starting production of our ad, the cost of purchasing airtime has gone up dramatically. We know that times are tough and not everyone can afford a large donation. But every donation, however small, is pooled together with the donations of thousands of other patriots from across the country to have a huge effect. In order to reach our goal of $150,000 by the end of the day, we still need 500 patriots to make a donation of $100 or more, and 100 heroes to make a donation of $500 or more. Our ability to counteract the lies and hate from the left depends on your support. Please, help the Tea Party movement by making a generous contribution. We continue to be humbled and honored by your support. Moneybomb for Tom Harmon: Flip the Senate!